Any books are great books for newborns as their tiny eyes and fingers begin to explore our world. In fact, words are where it’s really at, so reading from your favorite books and magazines are also great ways to interact with your baby and get them used to the cadences of the language(s) they will grow up around. But you can’t exactly stock their adorable little library with the more abstract concept of words. So here are my favorites for newborns that they can enjoy now and some even up to their toddler years. And, as always, shop local and shop bookstores! Singing slows down language and focuses the attention of babies and children. Essentials for any shelf! Expose your children now to the beautiful multi-ethnic world we live in. Great for new eyes that can focus more closely on the stark contrast between black and white. Make sure you get the foldout version! May be a bit “loved” if you check them out from the public library, so these are essentials for home libraries. My passion to be a youth services librarian has been permanently solidified after my internship at the Morgan County Public Library in Martinsville, Indiana. Although it was last summer (2011), I’m still reveling in the activities I undertook and the experiences that fueled my fire. Last summer, I was given the power to run the programming at the surrounding 5 branches. The theme of the 2011 Collaborative Summer Library Program was “One World, Many Stories,” which emphasized international stories and programs. I developed, publicized, and ran 3 programs: Go Dutch, In to India, and Let’s Eat in Japan. Preparation in itself was an experience. The age recommendation for the programs was 5-12 so I had to consider accommodating a wide age range. 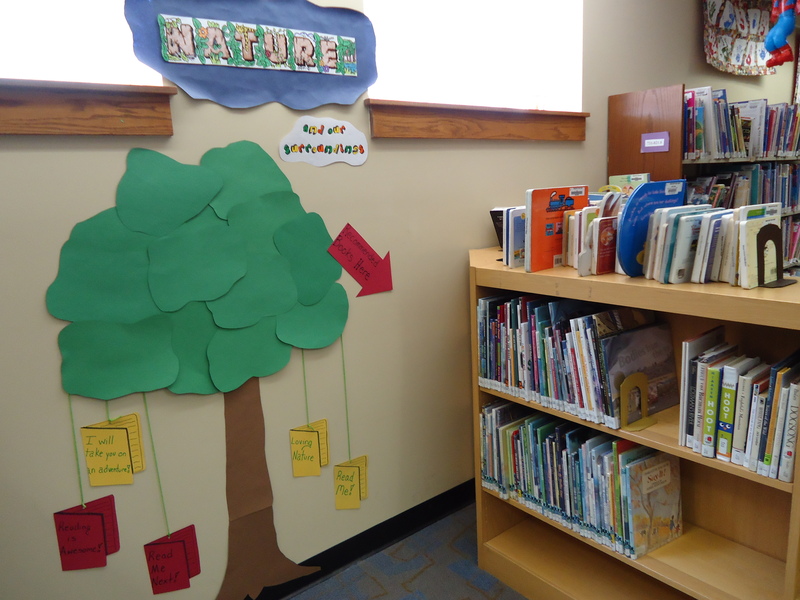 For crafts and activities, I used several resources including online blogs, craft books, and suggestions from the Collaborative Summer Library Program. I was particularly proud of incorporating Staphorster Stipwerk (dotwork from Staphorster, see left) for the Dutch program and an exciting, interactive chopstick relay race where the kids grabbed cotton balls with chopsticks in one cup and raced to another cup. While the latter activity could have crumbled into disarray, I made the instructions simple, precise, and poignant. I even made them repeat the the rules after me. It was rewarding to see that a big group of children will listen to you if you talk to them in the right way–and if you have patience. 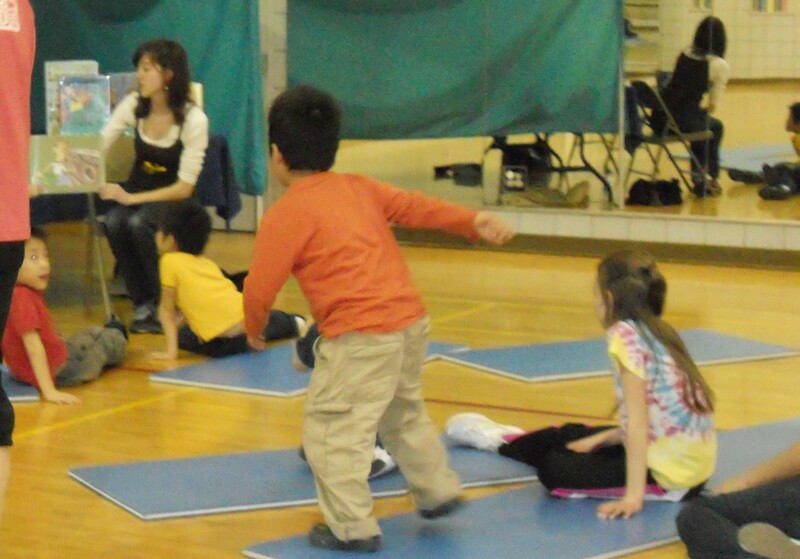 In addition to the crafts and activities, I also told a story for every program. I utilized my storytelling instructor’s structure for preparation, allowing me to help remember, envision, and tell the stories. I was also able to evaluate which stories are rich with tradition and interesting elements instead of full of fluff and forced morals. 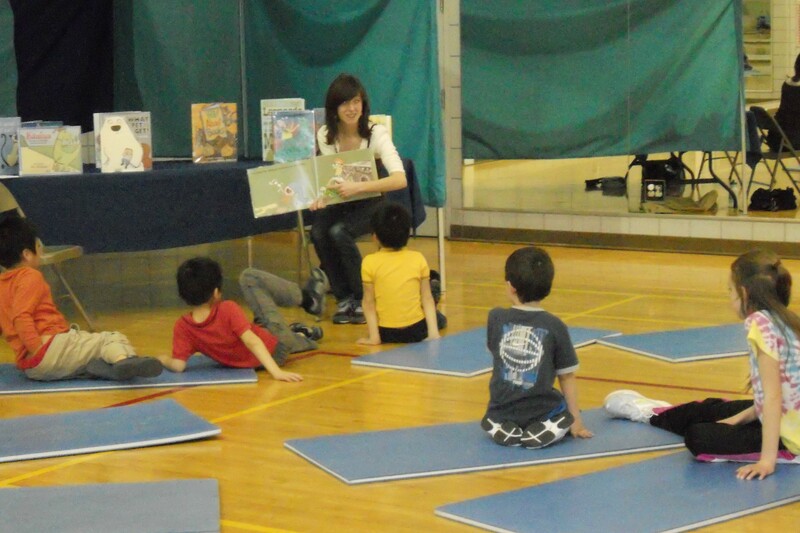 On top of the storytelling, I also read-aloud picture books which I practiced beforehand to avoid vocal stumbles. So the programs were a success. Around 110 kids attended, each branch varying from 4 to 30 children. I also assisted and observed several other programs including a heavily attended lego program, a program on Mexico, baby time, and a wrap-up program. At the main branch I worked the reference desk and provided suggestions for reading catered to individual interests. Several questions centered around the early reader section. I decided to promote the Lexile Reading Levels for the collection as a guide for parents and library employees. About half of the books already had the levels–not consistent enough to rely upon. 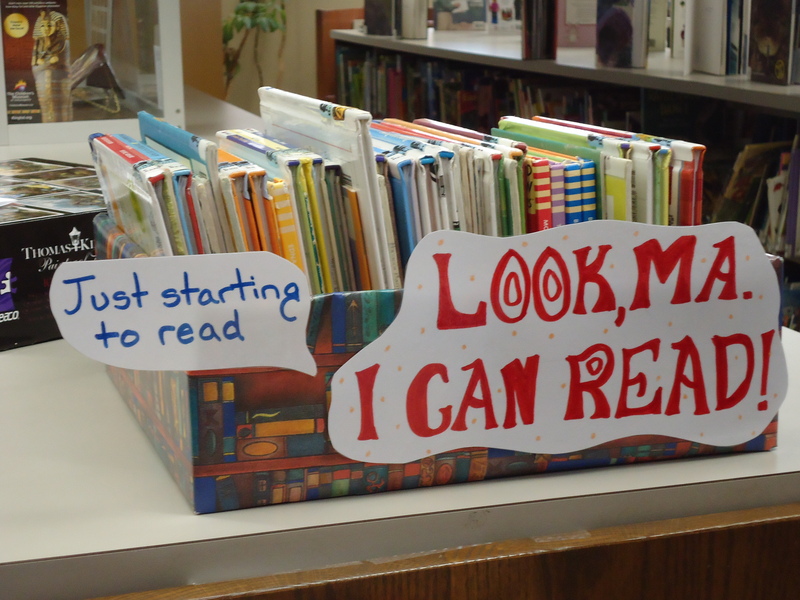 In addition to completing these labels, I created a nifty box to house the beginning reader books, the most commonly sought after early readers at MCPL. Furthermore, I helped assist with the teen summer reading program kick-off. Interacting with the teens was so much fun. Honestly, I can tolerate their angst, rowdiness, and confusion; rather, I admire their desire to be an individual, their passion to learn about the world, and their emergence into adulthood. For the past few weeks, I have been helping the children’s librarian, Alyssa, weed the collection. From my collection development class, we learned the value of weeding once per year so that MUSTIE books can be replaced (misleading, ugly, superseded, trivial, irrelevant, elsewhere). However, this was not the case in the children’s department. There were some pretty sad and ridiculous books I found including the entire technology section from the 1990s. While some child may have accidentally picked seen Scottie Pippen in The NBA’s Top Ten Forwards in Basketball Today, it was probably time to ditch that book and several other sport’s statistics books from 1993. While some craft books are hard to dispose of because the crafts are still relevant, I chose to weed craft books that weren’t as engaging as more recent craft books (superseded), or were in disrepair. While I kept older books that filled specific niches, general craft books that fit my above deselection choices were taken out. The weeding choices I made went to the librarian to determine if new books needed to be purchased to fill the ones that were leaving. Fortunately, most of the craft books were already superseded by current books in the collection. 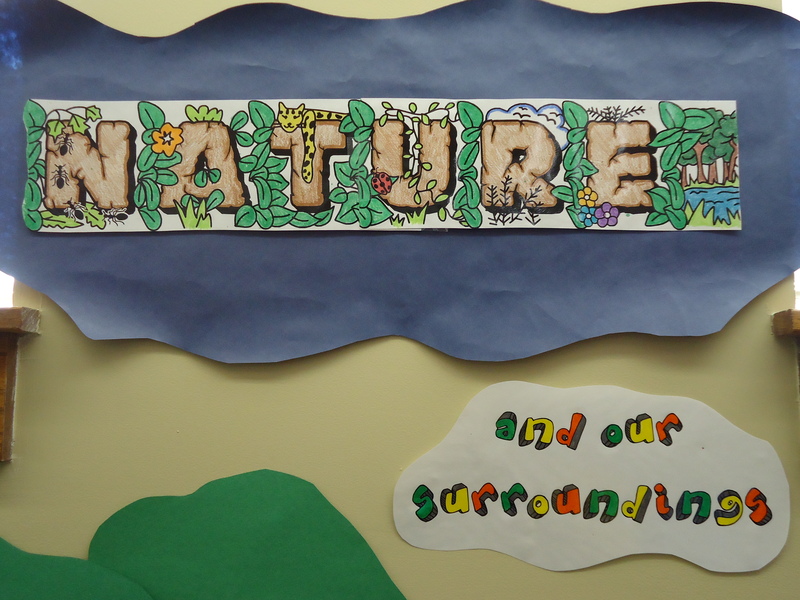 Before I finished my internship, I fulfilled my love of fun decorations and created a nature book display. It’s amazing how much time it takes to make a carefully selected around a theme and with literary valuable books. For my selection, I used the reference book A to Zoo: Subject Access to Children’s Picture Books under the theme “nature” which provided an extensive selection. However, the reference book was from 2007 so some of the books were older and not quite as attractive as the newer published material. I also used several professional organizations including the Cooperative Children’s Book Center. For newer material, I used booklists found on blogs of professionals in the field. Overall, my internship was incredibly beneficial towards me becoming a librarian. I finally saw my programming come to fruition! I used my knowledge of the literature I’ve been reading for the past few years. I don’t usually get to drip over the newest Mo Willems book to my friends and family (I don’t see why not. Pigeons driving buses is incredibly relevant in our world today). The following nonfiction books were published in 2011 and are award winners from the organizations listed in my previous post. 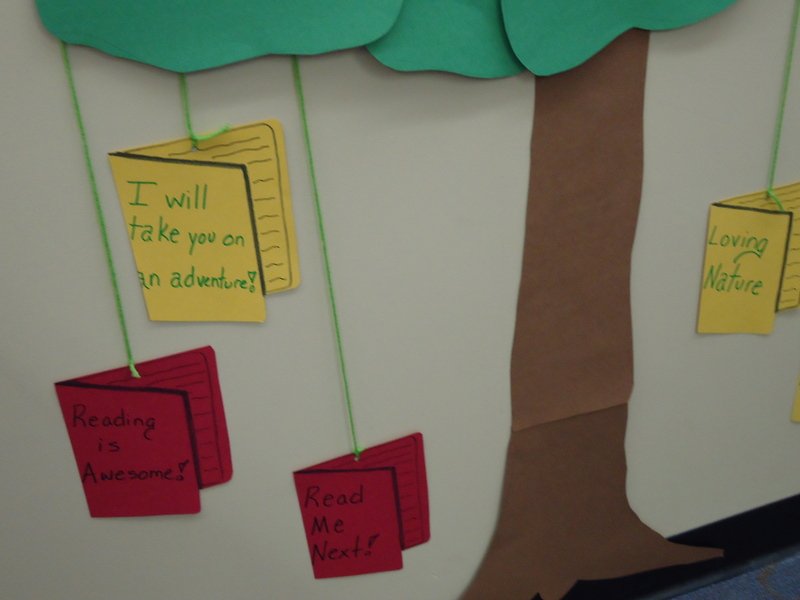 For more on my evaluation techniques and the importance of nonfiction for kids, check out my last post. 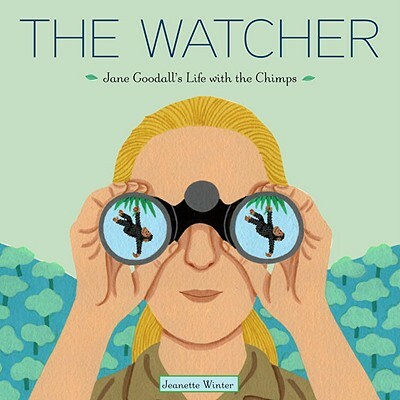 Synopsis: Always a watcher of the world around her, Jane Goodall takes her most important journey to Gombe, Africa where she conducted her monumental research on a group of chimpanzees.This story best exhibits the benefits of patience, gentleness, perseverance, and personal responsibility from Goodall’s childhood to old age. Review: The author wished that, as a child, she had a book with a brave, trail-blazing woman. This appears to be her main reason to write on Jane Goodall, but it is not shown that she is an expert on the subject. She has written almost 50 nonfiction titles. The author used 4 direct quotes from Goodall–an excellent touch of reality. Because there are no “real-life” pictures, this book does have the feel of fiction (this may be good or bad depending on the child). The biggest deterrent for the age group is the long length of the story. 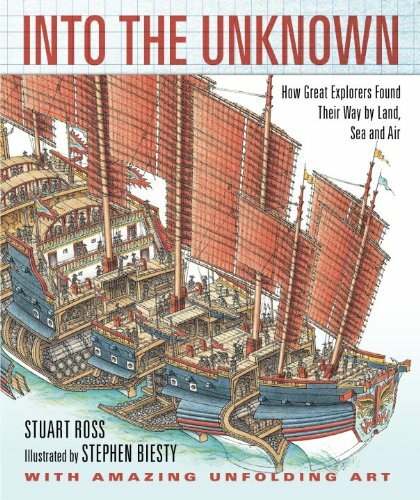 Review: Somewhat as an explorer himself, Ross has traveled all over the world to teach history, giving him acute insight into how students best learn the subject. Past the written word, the intricate cross-section by artist Stephen Bietsy (Incredible Cross-Sections) reveal the intense labor and dedication of the adventurers involved. Furthermore, the maps provide a valuable visual understanding. of each expedition. The foldouts also provide a unique feeling of discovery for the reader. Review: I hate to over exaggerate and call something a masterpiece, but this is pretty darn close. The artwork is engrossing, astonishing, and accurate (the artist has traveled across the world to draw and paint animals in the wild). Large pages and the charcoal medium capture movement, grace, and natural beauty from the tiger to the vulture. Jenkins’ expertise on endangered animals derives from his consultant undertaking for the World Conservation Monitoring Centre, which checks on the status of endangered species around the world. Jenkins doesn’t sugar coat the situation, but states that giving up protection efforts is not really an option. 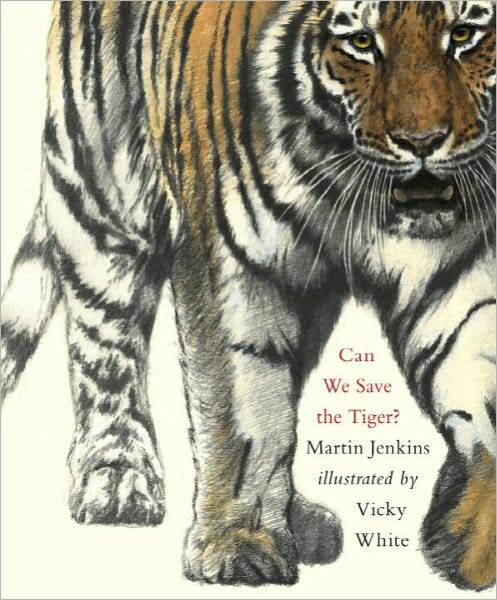 A conversational tone, this book is best read out loud and is a great introduction to programs on endangered species. Synopsis: “We know less about this huge watery kingdom than we do about many planets in our solar system.” From 2000 to 2010, more than 2,000 researchers from 82 countries sought to understand more about our oceans conducting the most extensive investigation of ocean life ever attempted. Johnson details 8 oceanic sections filled with creatures of the shores to creatures of the deep. Review: Johnson journeyed across the globe to get first hand accounts from scientists that participated in the study, quoting 18 scientists throughout the book. Her second-person narrative captivates children considering future marine biology professions, and also reveals her own passion for the ocean (being an avid scuba diver). 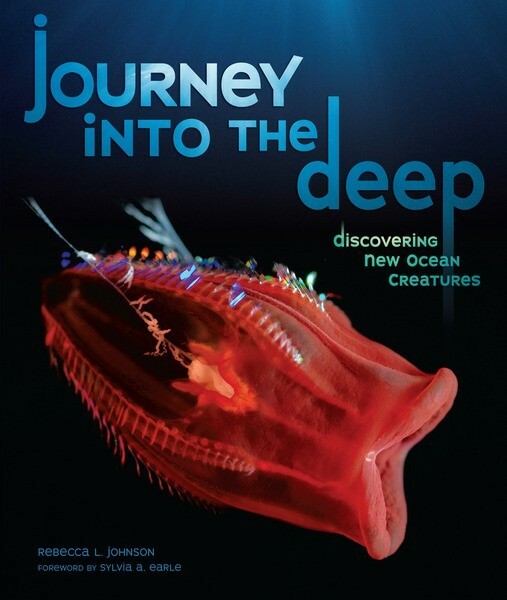 Great provision of yet-to-be-named oceanic life pictures mixed in with an exciting narrative of discovery. Synopsis: The land in Hargigo, Eritrea, Africa is dry and dusty. With little rainfall, the livestock do not have enough to eat, leaving little meat and milk for the citizens. 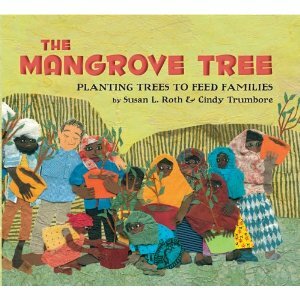 Part biography, part environmental success story, Roth and Trumbore describe the scientific undertaking of Dr. Gordon H. Sato to save this town in Africa with mangrove trees. With fertilizer, the diligent hands of women villagers, and the hungry stomachs of sheep and goats, the mangrove trees’ leaves plumped up the livestock, thus providing food and milk for the families. Review: This story is part cumulative tale (for younger listeners) and part fact-filled story (for older readers/listeners). The fact-filled story is told in a start-to-finish manner, including a lot of useful, scientific data. However, the large pictures are much more suited for the cumulative tale, which may leave listeners bored and unable to comprehend all the facts without a visual point of reference. The artwork is fun and textually intriguing. The afterword provides an excellent story of Gordon Soto, a glossary, and a pronunciation guide, perfect for school projects. Both authors showed an interest in the subject matter, but do not have expertise. Synopsis: Pablo Neruda wrote about the world around him: sometimes about love, other times about curiosity, and eventually about human injustice and protest. 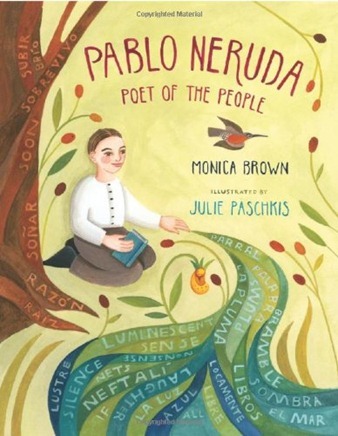 Brown creates a beautiful mosaic of Neruda’s life and his fascination with his surroundings. Review: This book excels in showcasing Pablo Neruda’s love of the world around him. 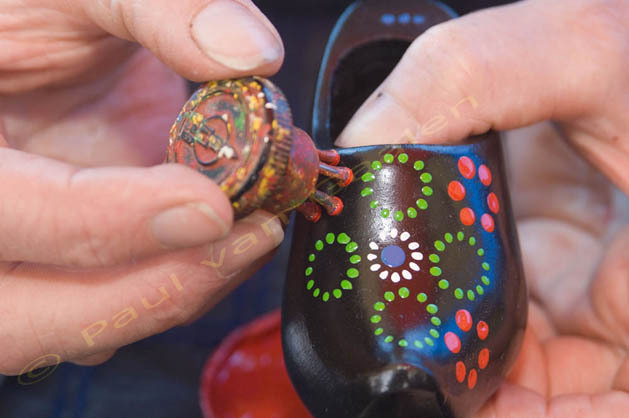 In each painting, Spanish and English words are interwoven in the images, showing children the connection between words and images (an early literacy skill). On top of this enriching integration of words, the artwork is stunningly filled with luscious colors that capture the true emotion of each scene. Illustrator Julie Paschkis traveled to Neruda’s home, clearly imbibing the Chilean surroundings. This would make an excellent book to spark a poetry program for children to write poetry about anything–just like Pablo Neruda! 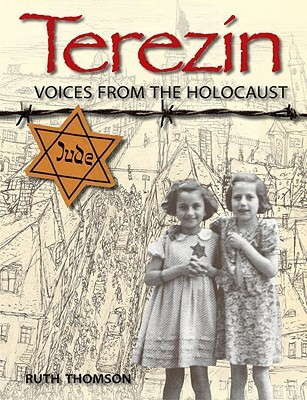 Synopsis: Between 1941 and 1945, Nazis turned the town of Terezin, Czechoslovakia, into a ghetto for thousands of displaced Czech Jewish people. Ruth Thomson provides a brief summary leading up to ghetto life, followed by the intensely dismal living conditions that demoralized and deteriorated the prisoner’s health. With an ever growing population that cramped living conditions and expedited disease and living quarters that separated families, combined with sudden transports away from the city in the middle of the night, life in Teresienstadt was stressful on the mind, body, and soul, leading up to a terrifying transport to a concentration death camp. Review: Informative text accompanied with direct quotes give this book an authoritative and real quality necessary for documentation (and for a child’s research project). Thomson place particular emphasis on the artists, the children, and the Nazi deception to outside groups such as the Red Cross. Thomson’s interest in the Czech ghetto arose during research on Holocaust art (she also has an MA in museum and gallery learning), which doesn’t show a strong specialty on the Holocaust but the existence of culture and art during historical time periods. The organization is easy to follow, filled with artwork, artifacts,and some photos–not trying to disturb the young audience but informing them on a tragic period in history. Timeline, glossary, sources, and index provided.